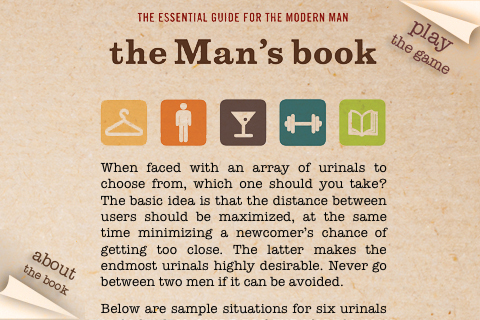 The ultimate for any man: an app to determine how well you pick the "right" urinal! 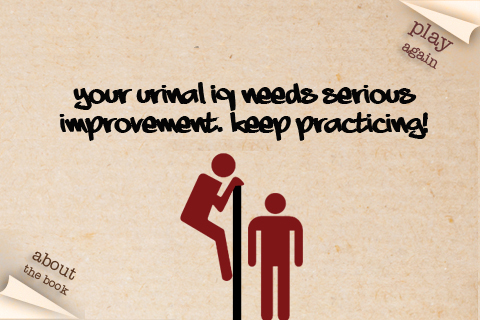 Play the game and see what your urinal IQ is--are you an expert, or do you take the urinal cake? Want to learn more? Read THE MAN'S BOOK: THE ESSENTIAL GUIDE FOR THE MODERN MAN, the SOURCE for everything you need to know about being a man today, including tips on everything from sideburns, to cooking meat, to potato guns. Updated links Bug fixes More.